Mannion’s shop originally started out as a thatched cottage built by Gerry’s grandfather, John Mannion (also known as “Black Jack” because of his very tanned skin). John originally came from Galway and the family think he may have been descended from the Spanish Armada. 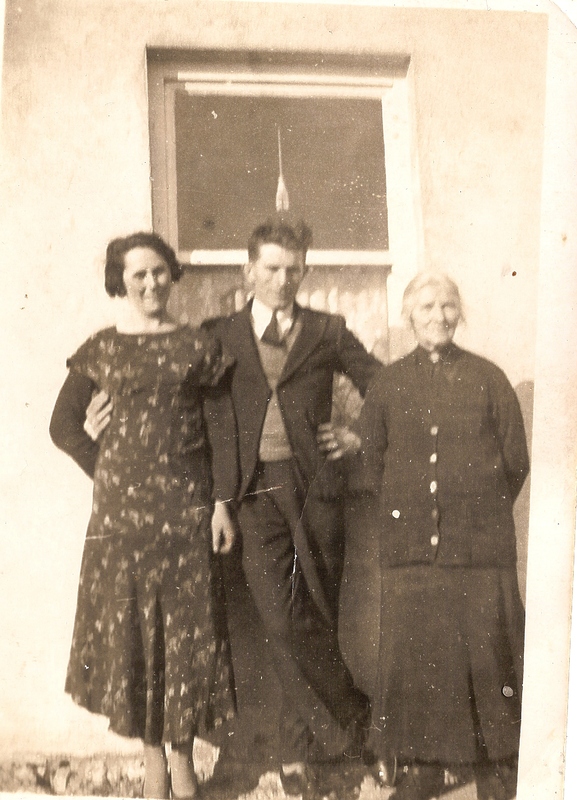 He met and married his wife Mary (nee Curly, Dangan) and went on to have 5 children, a boy named Gerald born c.1909 (father of the interviewee Gerry Mannion) and a daughter Nora known as Nano born in 1904,. They had 3 more daughters Emily and Katie, both teachers by profession who died in their early 20s from TB and a daughter Maisie, married and living in Newcastle, England. In 1909, the cottage where the family lived was transformed into a fine 2-storey house with the shop adjoining the side with a sloping roof. Nano ran the shop for her brother Ger until he married Ellen (nee Forde) in the early 1930s. The shop was refurbished in 1936 but unfortunately burned down in 1971. The bakery goods for the shop were supplied by Clorans, Shop St., Tuam, Cheevers of Moylough and O’Reilly’s bakery, Old Road, Tuam. The shop also supplied light hardware e.g. brushes, hay forks etc. to its customers and these were supplied by Gilmore’s of Moylough and Somer’s of Athenry. They also supplied toys for Christmas which included “golly wogs”, teddy bears on tricycles, little cars and Christmas stockings. Caltex Oil Co., Galway, supplied paraffin oil for the fodder lamps for the local farmers. Loose tea arrived by train to Ballyglunin station in a tea chest which was 3ft x 3ft lined with tinfoil directly from India. Ger Mannion travelled to Ballyglunin station with his horse and cart and collected the supplies from the train and sometimes delivered to other shops e.g. Daly’s, Derreen, on the return journey home. The tea-chests were used as playpens for children and there was often a waiting list of 3 to 4 months in order to secure a tea-chest for various homes in the area. There was a half inch lathe around the chest which became a teething ring for the toddlers and when this was well chewed it was time for the child to leave the ‘play pen’. Gilmore’s travelling shop also visited Mannion’s shop on a Thursday for batterin, (or bartering) where the customer’s would bring their eggs and buy groceries in exchange. If the customer did not have the money to pay for their groceries, they would “ticket and strap it” (put on account) until money became available when crops or cattle were sold. The shop had an L shaped counter with the “Eggler” in it for the eggs. The customer would ask for what they wanted and there was a weighing scale on the counter. Customers brought their own shopping bags or baskets. The cigarettes were kept over the fireplace to protect them from dampness. John Player, Sweet Afton, Gold Flake and Woodbine were the cigarette brands and plug tobacco and Clark’s tobacco were also supplied for the pipe smokers in the area. There was a loft on top of the store where supplies were kept and they would be taken down for display when needed. The shop usually opened at 9.30 and closed at about 6p.m. but the shop would be opened at any time outside of these hours if requested. Ration books were introduced in 1945 and Nano did her best to “keep the wolf from the door” and look after everyone as best she could. She kept extra supplies for the families with a lot of children as they were often the hungriest. Nano was a very kind and religious lady and she often gave what she could to the Poor Clare Nuns in Galway city who on occasion, would visit her in Dangan]. My wonderful grandparents. So lovely to see them looking so young and their whole lives ahead of them. I have precious memories of them both and auntie nano in their twilight years. Gentle kind and never forgotten. My mom (Mary Mannion) used to look forward to bringing all 6 of us back home for the summer holidays, she missed her mother and father and Nano so much. A very special time. Gone but never forgotten.